5 Sesión 1. CUESTIONAR A LOS NIÑOS Y NIÑAS PARA SABER SUS CONOCIMIENTOS PREVIOS ACERCA DE SUS DERECHOS Y DEBERES. ¿QUÉ SON LOS DERECHOS? ¿PARA QUÉ SIRVEN? ¿CUÁLES SON? ¿QUÉ SON LAS OBLIGACIONES? ¿POR QUÉ TENEMOS OBLIGACIONES? ¿CUÁLES SON? COMENTAR LAS RESPUESTAS DE LOS ALUMNOS. POSTERIORMENTE VER EL VIDEO DE YOU TUBE Y PEDIR A LOS NIÑOS QUE COMENTEN: ¿DE QUÉ DERECHOS NOS HAN HABLADO?¿CONOCIAN ESOS DERECHOS? ¿LOS ADULTOS CONOCEN LOS DERECHOS Y OBLIGACIONES DE LOS NIÑOS? ¿DE QUÉ MANERA LOS PODEMOS INFORMAR ACERCA DE LOS DERECHOS Y OBLIGACIONES? 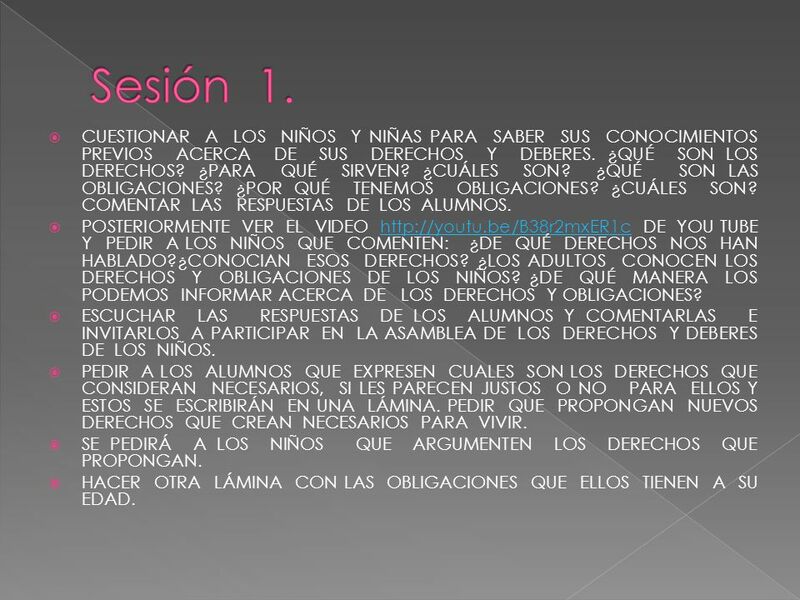 ESCUCHAR LAS RESPUESTAS DE LOS ALUMNOS Y COMENTARLAS E INVITARLOS A PARTICIPAR EN LA ASAMBLEA DE LOS DERECHOS Y DEBERES DE LOS NIÑOS. 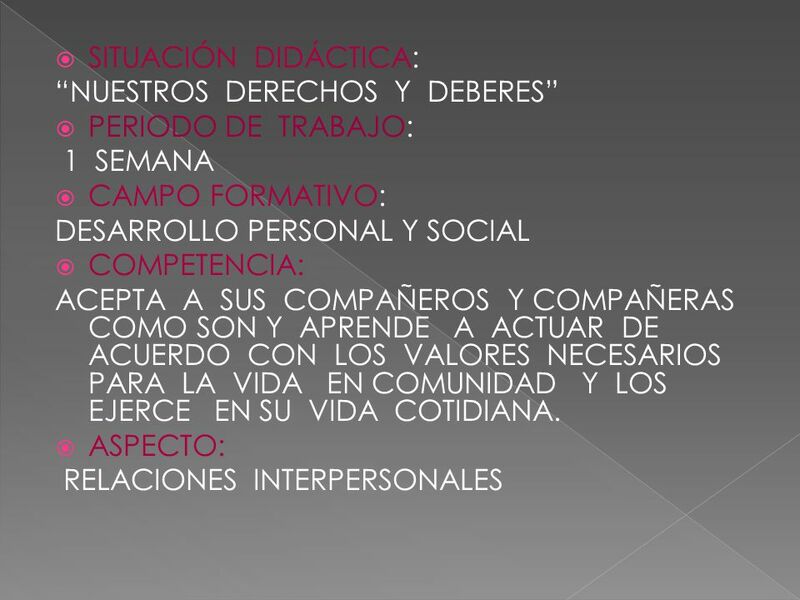 PEDIR A LOS ALUMNOS QUE EXPRESEN CUALES SON LOS DERECHOS QUE CONSIDERAN NECESARIOS, SI LES PARECEN JUSTOS O NO PARA ELLOS Y ESTOS SE ESCRIBIRÁN EN UNA LÁMINA. PEDIR QUE PROPONGAN NUEVOS DERECHOS QUE CREAN NECESARIOS PARA VIVIR. SE PEDIRÁ A LOS NIÑOS QUE ARGUMENTEN LOS DERECHOS QUE PROPONGAN. HACER OTRA LÁMINA CON LAS OBLIGACIONES QUE ELLOS TIENEN A SU EDAD. 6 ASIGNAR A CADA ALUMNO UN DERECHO O UN DEBER DE LA LISTA QUE SE HA ELABORADO Y PEDIR QUE ELABOREN UN CARTEL QUE EJEMPLIFIQUE SU CONTENIDO. 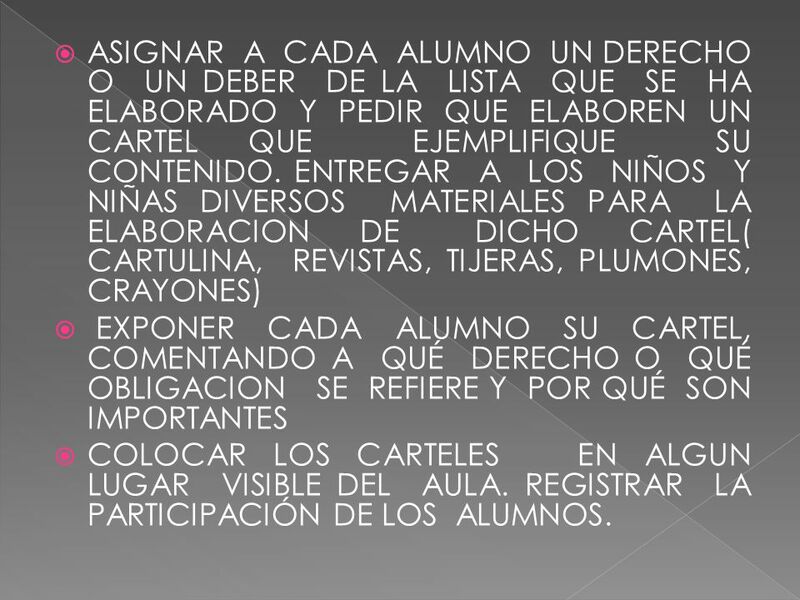 ENTREGAR A LOS NIÑOS Y NIÑAS DIVERSOS MATERIALES PARA LA ELABORACION DE DICHO CARTEL( CARTULINA, REVISTAS, TIJERAS, PLUMONES, CRAYONES) EXPONER CADA ALUMNO SU CARTEL, COMENTANDO A QUÉ DERECHO O QUÉ OBLIGACION SE REFIERE Y POR QUÉ SON IMPORTANTES COLOCAR LOS CARTELES EN ALGUN LUGAR VISIBLE DEL AULA. REGISTRAR LA PARTICIPACIÓN DE LOS ALUMNOS. 7 Sesión 2. 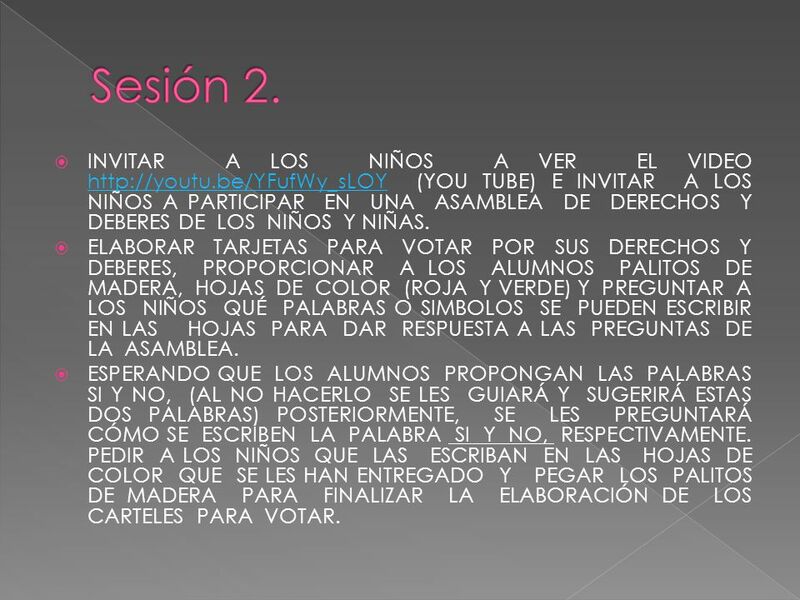 INVITAR A LOS NIÑOS A VER EL VIDEO (YOU TUBE) E INVITAR A LOS NIÑOS A PARTICIPAR EN UNA ASAMBLEA DE DERECHOS Y DEBERES DE LOS NIÑOS Y NIÑAS. ELABORAR TARJETAS PARA VOTAR POR SUS DERECHOS Y DEBERES, PROPORCIONAR A LOS ALUMNOS PALITOS DE MADERA, HOJAS DE COLOR (ROJA Y VERDE) Y PREGUNTAR A LOS NIÑOS QUÉ PALABRAS O SIMBOLOS SE PUEDEN ESCRIBIR EN LAS HOJAS PARA DAR RESPUESTA A LAS PREGUNTAS DE LA ASAMBLEA. 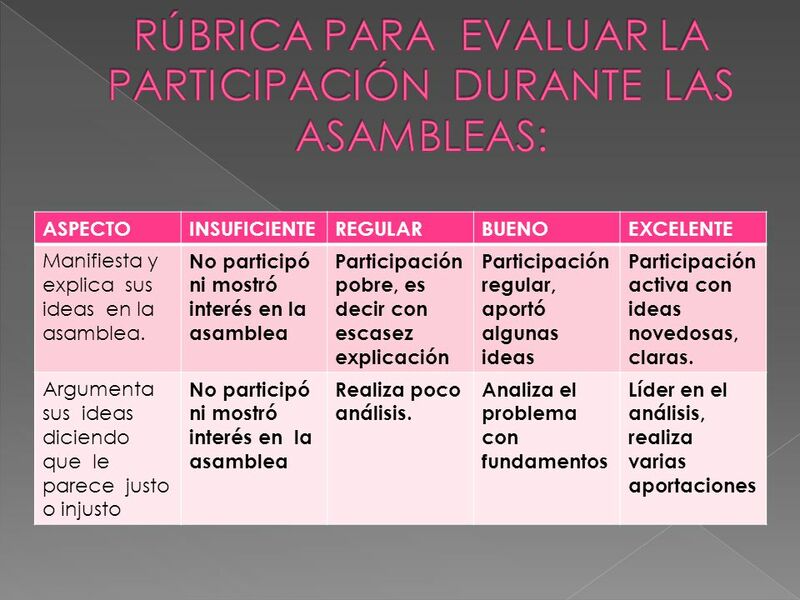 ESPERANDO QUE LOS ALUMNOS PROPONGAN LAS PALABRAS SI Y NO, (AL NO HACERLO SE LES GUIARÁ Y SUGERIRÁ ESTAS DOS PALABRAS) POSTERIORMENTE, SE LES PREGUNTARÁ CÓMO SE ESCRIBEN LA PALABRA SI Y NO, RESPECTIVAMENTE. 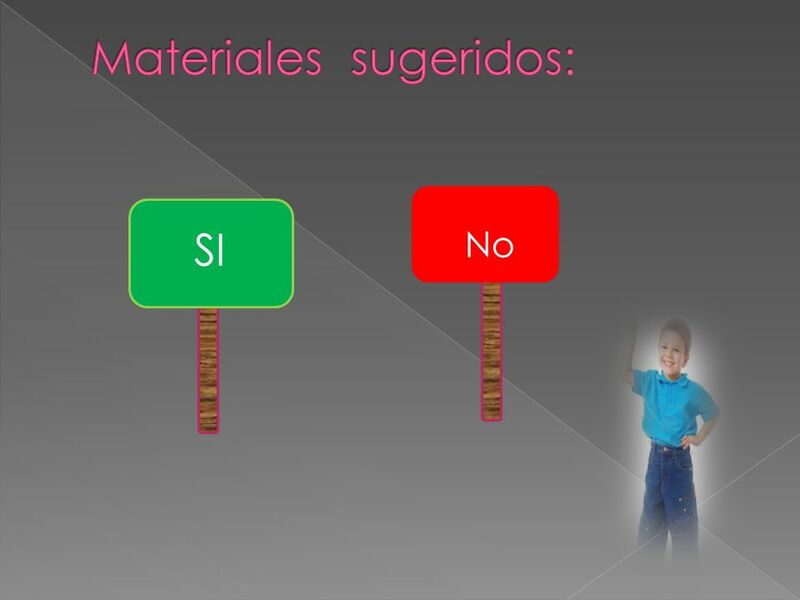 PEDIR A LOS NIÑOS QUE LAS ESCRIBAN EN LAS HOJAS DE COLOR QUE SE LES HAN ENTREGADO Y PEGAR LOS PALITOS DE MADERA PARA FINALIZAR LA ELABORACIÓN DE LOS CARTELES PARA VOTAR. 9 Sesión 3. AL TERMINAR DE ELABORAR LAS TARJETAS, INVITAR A LOS NIÑOS A PARTICIPAR EN LA ASAMBLEA DE DERECHOS Y DEBERES DE LOS NIÑOS Y NIÑAS, FORMAR UN SEMICÍRCULO EN EL SALÓN DE CANTOS Y JUEGOS, UTILIZANDO LAS SILLAS. COLOCAR UNA MESA EN EL CENTRO EN DONDE ME COLOCARÉ CON LAS TARJETAS DE PREGUNTAS. INFORMAR A LOS NIÑOS Y NIÑAS QUE LA FINALIDAD DE LA ASAMBLEA ES DISCUTIR QUÉ DERECHOS Y QUEÉ DEBERES LES PARECEN NECESARIOS, JUSTOS O INJUSTOS DESDE SU PUNTO DE VISTA, PODRÁN PARTICIPAR ESCUCHANDO LAS PREGUNTAS QUE REALIZARÉ Y DESPUÉS LEVANTARÁN LA TARJETA QUE PODRÁN USAR PARA VOTAR DE ACUERDO A LA RESPUESTA QUE CREAN CORRECTA. CONTESTANDO SI O NO DE ACUERDO A LA PREGUNTA. DESPUÉS DE VOTAR EN CADA PREGUNTA, SE DARÁ PASO A LA REFLEXIÓN: PIDIENDO QUE ARGUMENTEN SUS RESPUESTAS Y REFLEXIONEN EN RELACIÓN A LA PREGUNTA QUE SE LES HA HECHO. LAS PREGUNTAS PODRÁN SER: ¿LOS NIÑOS Y NIÑAS TIENEN DERECHO A PERTENECER A UNA FAMILIA? ¿LOS NIÑOS Y NIÑAS DEBEN HACER SUS TAREAS DE LA ESCUELA? ¿TENEMOS DERECHO A ALIMENTARNOS SANAMENTE? ¿NOS PODEMOS SALIR DE LA CASA O DE LA ESCUELA SIN PERMISO DE NUESTROS PADRES? ¿DEBEMOS TENER LA OPORTUNIDAD DE IR A LA ESCUELA TODOS LOS DÍAS? ¿LOS NIÑOS Y NIÑAS DEBEN TRABAJAR PARA LLEVAR DINERO A SUS CASAS? ¿CUÁNDO UN NIÑO O NIÑA SE ENFERMA DEBE RECIBIR ATENCIÓN MÉDICA? ¿LOS NIÑOS Y NIÑAS PUEDEN HACER LO QUE ELLOS QUIERAN, SIN OBEDECER Y RESPETAR REGLAS? ¿LOS NIÑOS Y NIÑAS PUEDEN TIRAR LA COMIDA QUE NO LES GUSTA A LA BASURA? ¿LOS NIÑOS Y NIÑAS DEBEN AYUDAR EN CASA EN LABORES SENCILLAS, COMO LEVANTAR SU PLATO SUCIO Y HACER SU CAMA? LAS PREGUNTAS SE REALIZARÁN CON BASE EN LOS CONTENIDOS QUE SE HAN VISTO EN DÍAS ANTERIORES CON RELACIÓN A SUS DERECHOS Y DEBERES. PARA FINALIZAR SE LES INVITARÁ A LOS NIÑOS Y NIÑAS A CUMPLIR CON SUS OBLIGACIONES EN CASA Y ESCUELA. PREGUNTAR A LOS NIÑOS: ¿QUÉ LES HA PARECIDO LA ACTIVIDAD? ¿LES HA PARECIDO INTERESANTE? ¿DE QUÉ DISCUTIMOS EN EL DEBATE? REGISTRAR LAS PARTICIPACIONES DE LOS ALUMNOS Y ALUMNAS. 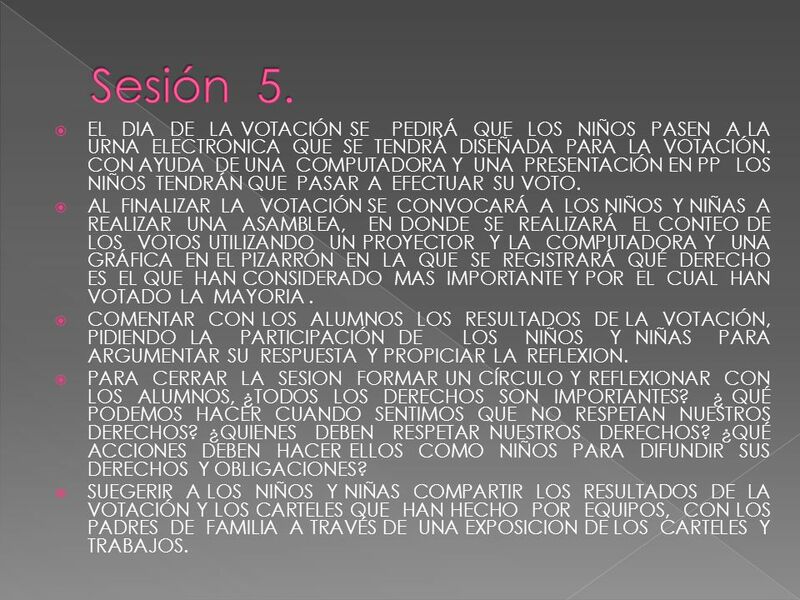 10 Sesión 4. PEDIR A LOS ALUMNOS QUE PIENSEN EN CUÁL ES EL DERECHO QUE CONSIDERAN MÁS IMPORTANTE E INVITARLOS A PARTICIPAR EN UNA VOTACIÓN. SE LES PEDIRÁ QUE PARTICIPEN EN LA ELABORACIÓN DE UNA LISTA ESCRIBIENDO LOS DERECHOS QUE CONSIDEREN MÁS IMPORTANTES PARA ELLOS, PREGUNTÁNDOLES ¿POR QUÉ PIENSAS QUE ESTE DERECHO ES IMPORTANTE? 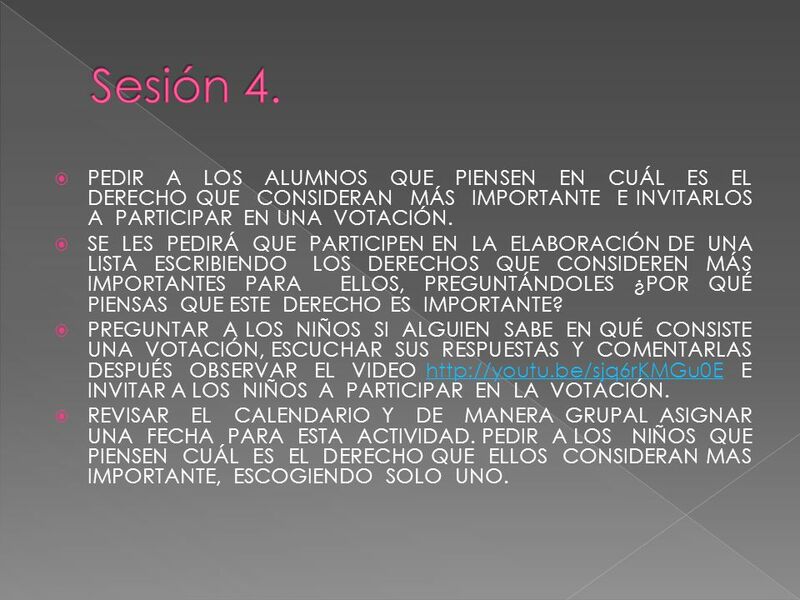 PREGUNTAR A LOS NIÑOS SI ALGUIEN SABE EN QUÉ CONSISTE UNA VOTACIÓN, ESCUCHAR SUS RESPUESTAS Y COMENTARLAS DESPUÉS OBSERVAR EL VIDEO E INVITAR A LOS NIÑOS A PARTICIPAR EN LA VOTACIÓN. 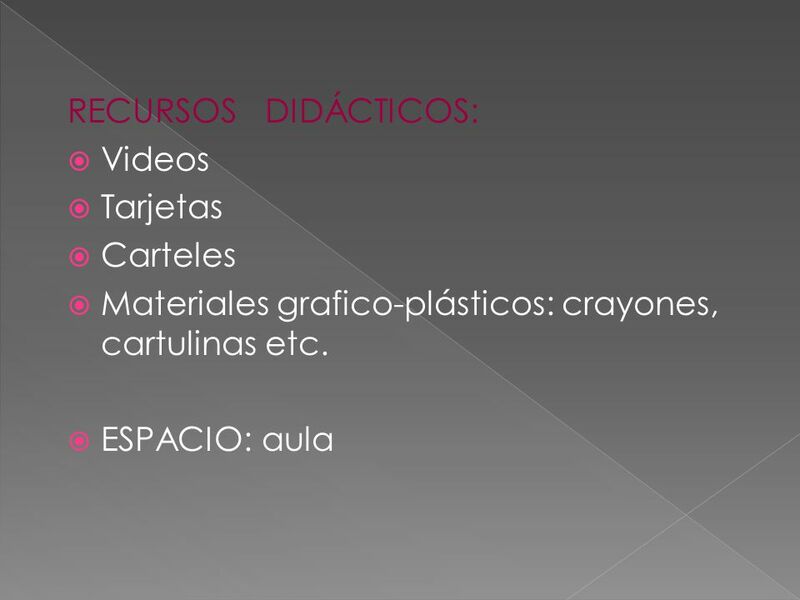 REVISAR EL CALENDARIO Y DE MANERA GRUPAL ASIGNAR UNA FECHA PARA ESTA ACTIVIDAD. 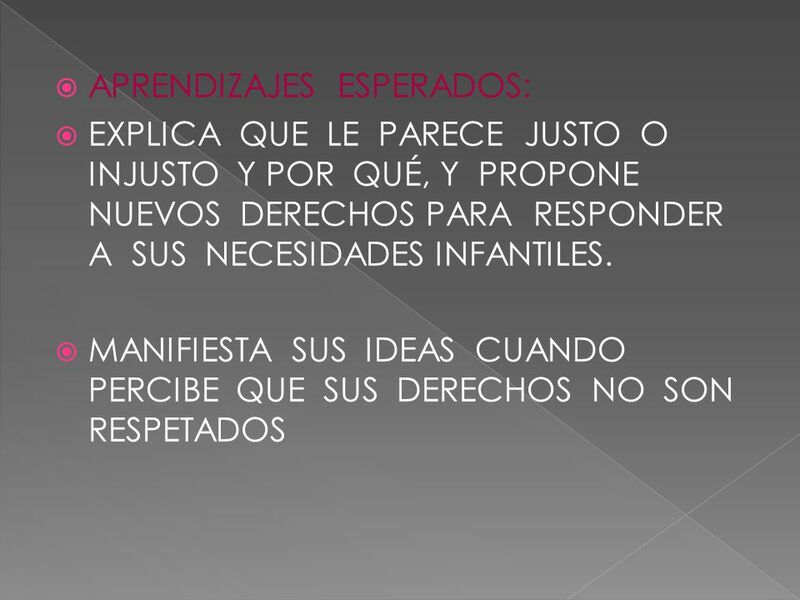 PEDIR A LOS NIÑOS QUE PIENSEN CUÁL ES EL DERECHO QUE ELLOS CONSIDERAN MAS IMPORTANTE, ESCOGIENDO SOLO UNO. 11 Sesión 5. EL DIA DE LA VOTACIÓN SE PEDIRÁ QUE LOS NIÑOS PASEN A LA URNA ELECTRONICA QUE SE TENDRÁ DISEÑADA PARA LA VOTACIÓN. CON AYUDA DE UNA COMPUTADORA Y UNA PRESENTACIÓN EN PP LOS NIÑOS TENDRÁN QUE PASAR A EFECTUAR SU VOTO. AL FINALIZAR LA VOTACIÓN SE CONVOCARÁ A LOS NIÑOS Y NIÑAS A REALIZAR UNA ASAMBLEA, EN DONDE SE REALIZARÁ EL CONTEO DE LOS VOTOS UTILIZANDO UN PROYECTOR Y LA COMPUTADORA Y UNA GRÁFICA EN EL PIZARRÓN EN LA QUE SE REGISTRARÁ QUÉ DERECHO ES EL QUE HAN CONSIDERADO MAS IMPORTANTE Y POR EL CUAL HAN VOTADO LA MAYORIA . COMENTAR CON LOS ALUMNOS LOS RESULTADOS DE LA VOTACIÓN, PIDIENDO LA PARTICIPACIÓN DE LOS NIÑOS Y NIÑAS PARA ARGUMENTAR SU RESPUESTA Y PROPICIAR LA REFLEXION. PARA CERRAR LA SESION FORMAR UN CÍRCULO Y REFLEXIONAR CON LOS ALUMNOS, ¿TODOS LOS DERECHOS SON IMPORTANTES? ¿ QUÉ PODEMOS HACER CUANDO SENTIMOS QUE NO RESPETAN NUESTROS DERECHOS? ¿QUIENES DEBEN RESPETAR NUESTROS DERECHOS? ¿QUÉ ACCIONES DEBEN HACER ELLOS COMO NIÑOS PARA DIFUNDIR SUS DERECHOS Y OBLIGACIONES? SUEGERIR A LOS NIÑOS Y NIÑAS COMPARTIR LOS RESULTADOS DE LA VOTACIÓN Y LOS CARTELES QUE HAN HECHO POR EQUIPOS, CON LOS PADRES DE FAMILIA A TRAVÉS DE UNA EXPOSICION DE LOS CARTELES Y TRABAJOS. 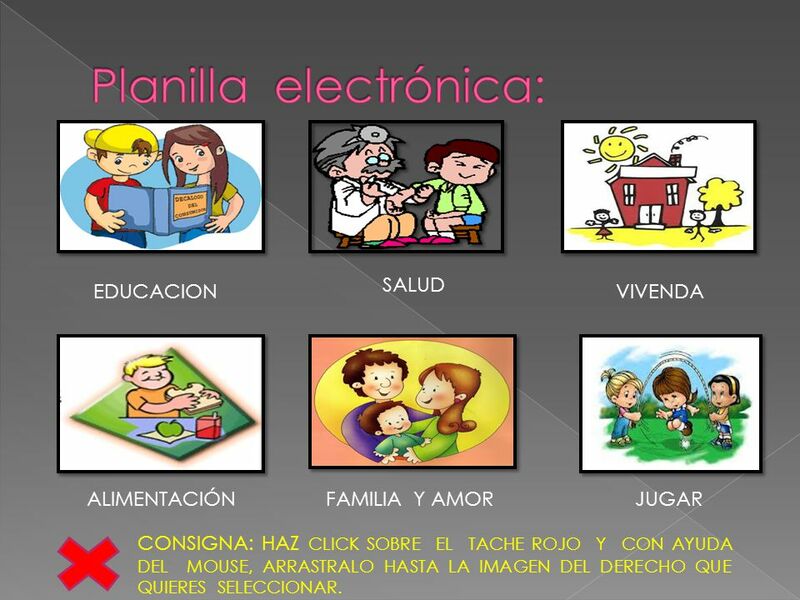 SALUD EDUCACION VIVENDA ALIMENTACIÓN FAMILIA Y AMOR JUGAR CONSIGNA: HAZ CLICK SOBRE EL TACHE ROJO Y CON AYUDA DEL MOUSE, ARRASTRALO HASTA LA IMAGEN DEL DERECHO QUE QUIERES SELECCIONAR. 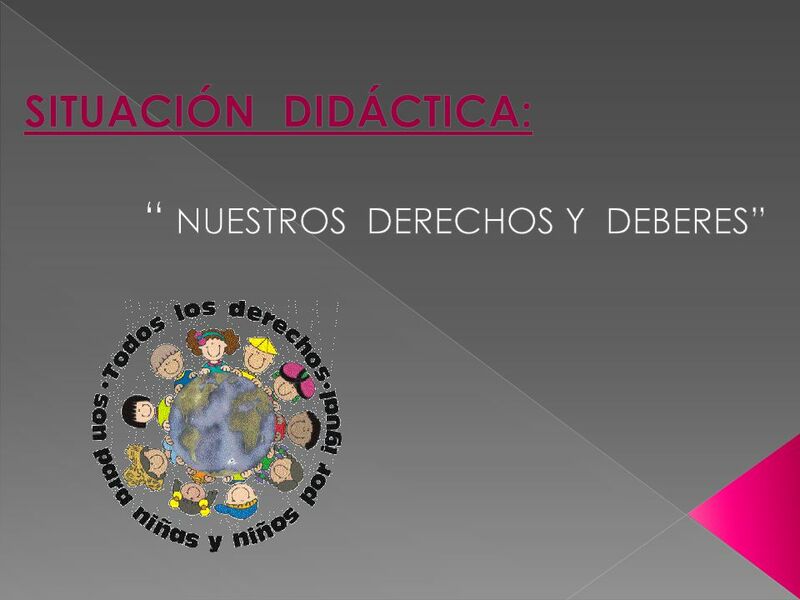 Descargar ppt "SITUACIÓN DIDÁCTICA: “ NUESTROS DERECHOS Y DEBERES”"
Enseñar valores a los niños es un proyecto de toda la vida. Hay muchas cosas que entran en juego cuando se enseñan valores, como identificar los valores.